FRENCHMAN Sebastien Ogier has won a hard-fought Rally Italia Sardegna, boosting his campaign for a second straight FIA World Rally Championship. The Volkswagen Polo R driver took the lead of the WRC sixth round on Saturday after his constant pressure appeared to force teammate Jari-Matti Latvala into a costly mistake. With a 1 min 40.2 secs lead heading into Sunday’s final leg, Ogier only had to keep out of trouble on the remaining quartet of rough gravel stages to take maximum points. He did exactly that and finished with a 1 min 23.1 sec advantage over second-placed Citroen driver Mads Ostberg of Norway. After overcoming his Saturday setback, when he had to stop to change a wheel after hitting a rock, Finland’s Latvala poured his own pressure on Ostberg but had to settle for third place, just less than 10 secs behind. Ogier’s championship standing was increased by a bonus point when he finished third on the rally-ending Power Stage at Cala Flumini. 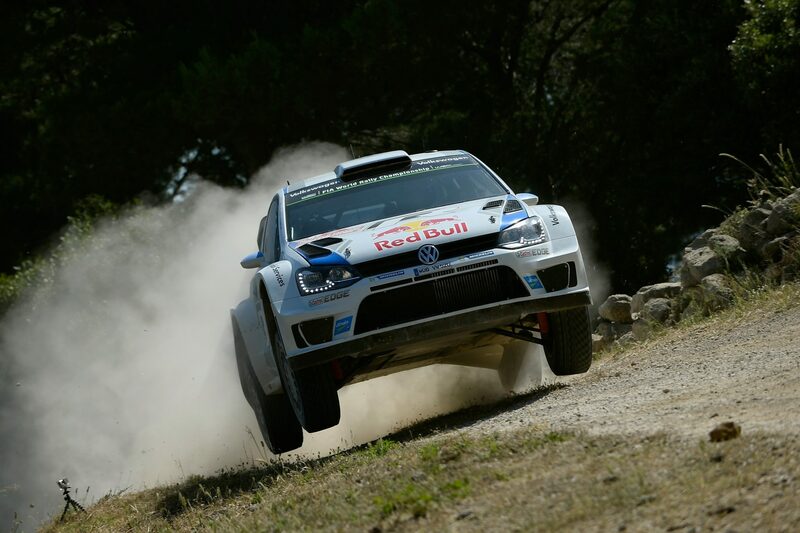 The Rally Italia Serdegna result boosted the factory Volkswagen team’s impressive tally of wins to 16 since it joined the WRC at the start of 2013. Italy was its 10th straight win; Ogier has won four times this year and Latvala twice. Ogier will head into the upcoming Rally Poland with a 33-point lead over Latvala in the championship. “I had a very tough beginning on this rally and had to put pressure on Jari (Matti Latvala) yesterday. Luckily that paid off and this is a really good feeling,” he said. Ostberg moved up to third in the 13-round series after a confident performance in his Citroen DS3 WRC. He started the final day with the pressure of Latvala only 21.3 sec behind, but he expertly managed the gap. Latvala beat him on three of the day’s four stages but his time gain wasn’t enough to edge past into second and Ostberg took the place by 9.7 sec. Power Stage winner Andreas Mikkelsen ended the event in fourth place for Volkswagen. The bonus points on the final stage were all the Norwegian had to fight for given the size of the gap ahead to Latvala. But victory in the 8.8km test ensured he and co-driver Ola Floene renewed their relationship on a high. The Ford Fiesta RS WRCs of Elfyn Evans and Martin Prokop rounded out the top six. Evans bettered his 2013 result, when he was driving a WR Car for the first time. Privateer driver Henning Solberg finished seventh in his M-Sport-prepared Ford Fiesta RS WRC and was more than five minutes ahead of Robert Kubica’s identical machine. Ex-Formula 1 driver Kubica had slipped down the order after picking up 10 minutes of penalties on Saturday. Ninth place was filled by the Ford Fiesta RRC of WRC 2 winner Lorenzo Bertelli, while Khalid Al-Qassimi could only end the event in 10th after suffering with set-up problems for much of the rally in his Citroen DS3 WRC. Bertelli, who had taken the WRC 2 lead when rival Nasser Al-Attiyah rolled on Saturday’s final stage, was thrilled to take maximum championship points on home soil. “First place in Italy is amazing for me – I’m really happy,” he said. New Zealander Hayden Paddon finished in 12th place and first of the Hyundai drivers in his WRC debut with the Korean squad. Hyundai’s number one driver Thierry Neuville was 16th, unable to recover from suspension damage on Friday. Juho Hanninen retired after rolling his Hyundai i20 WRC on Friday – but after claiming his first-ever WRC stage win on Special Stage 3, with Neuville providing an historic debut 1-2. Paddon adopted a mature approach to his first attempt at Rally Italia Sardegna and settled into the team with ease. He encountered an engine misfire during Saturday’s final stage after going through a water splash but the team worked hard overnight to refresh the car for the final day. “The guys did a great job last night to repair the car and to get me back out into the rally today,” Paddon said at the finish. “I knew it was going to be a tough first rally with the team because I have never driven here before, but we have had good progression. We’ve not been pushing and have concentrated on getting to the end of each stage, learning as much as possible both for myself and for the team. Paddon and Australian driver Chris Atkinson will be with the Hyundai team when the WRC visits the New South Wales Coffs Coast for Coates Hire Rally Australia on 11-14 September. Rally Italia Sardegna’s toughest luck was heaped on M-Sport driver Mikko Hirvonen, whose Fiesta RS caught fire on the liaison section between the third and fourth stages on Friday. The car was destroyed, but Hirvonen and co-driver Jarmo Lehtinen were unhurt.